Thrill Scale (0=Wimpy!, 10=Yikes! ): 2.5 Gentle motion simulation, moderate height and "soaring" simulation. Uses Fastpass at Disney California Adventure. For Epcot, discover how to use MyMagic+ and Fastpass+. The vintage aviation hangar at Disney California Adventure belies the high-tech attraction within. Epcot's The Land is the place to go Soarin' at Walt Disney World. Sharing the bottom floor with the huge Sunshine Seasons food court (where you can find some unique and delicious "fast-casual" fare), the entrance and queue area for the ride looks like a bustling modern-day airport terminal. Would You Be Able to Handle Soarin&apos;? The, um, soaring soundtrack begins, the motion units rise up and toward the screen, and riders are gliding through the air. The illusion is stunning. The banks of seats have a fairly limited range of motion, but they sure make passengers feel like they're airborne. If heights make you a bit queasy, let alone the thought of an actual hang gliding ride, don't necessarily dismiss Soarin's virtual hang gliding attraction. While the overall ride is exhilarating—thrilling even—the ride experience is quite gentle and doesn't contain any typical thrill ride gotchas. Once riders get past the initial sensation, it's generally smooth sailing. Very young riders might find the attraction a bit overwhelming, but the 40-inch height restriction would prevent them from riding anyways. Most riders will want to keep their eyes wide open for Soarin's journey. The adventure includes dramatic swoops above the South Pacific, the Great Wall of China, Sydney Harbor, and the Great Pyramids of Egypt. The transitions from scene to scene—clouds and fog momentarily obscure the view and set the stage for the next vista—are a bit perplexing. At some level, Soarin' demands a suspension of reality, but no amount of pixie dust can justify shifting from the desert to crashing waves in the blink of an eye. Also, unlike most vaunted Disney attractions, Soarin' doesn't tell a linear story; it's a bunch of wordless scenes mashed together into a grand travelogue. Other distractions include breaching whales that have been too obviously rendered using computer animation. And, depending on how far you are located from the center of the theater, you may see a severely distorted Eiffel Tower in the Paris scene. But these seem like petty quibbles for such a wildly unique attraction. A multi-modal ride, Soarin' incorporates sensory effects such as fans to lightly muss riders' hair and enhance the flying fantasy. The sense of smell even plays a role as the unmistakable aroma of flowers accompanies a pass above India. It's the kinetic and perceived sensation of motion, however, that's most remarkable. Soarin' takes the concept of a flight simulator attraction, pioneered in rides such as Disney's Star Tours, and gooses it to a new level by using its innovative flying motion bases to conjure hang gliding. While it represents a next-generation Imagineering feat, Soarin' also borrows from "speed room" technology used in past Disney attractions such as Disneyland's PeopleMover and Epcot's Horizons and World of Motion. In those relatively low-tech rides, vehicles on a track would travel toward a screen projecting images that suggested forward movement. Riders felt as if they were accelerating into the screens. The only remaining Disney speed room, I believe, is in Buzz Lightyear's Space Ranger Spin at Walt Disney World's Magic Kingdom. It holds over the effect from If You had Wings, the attraction that once occupied its Tomorrowland building. 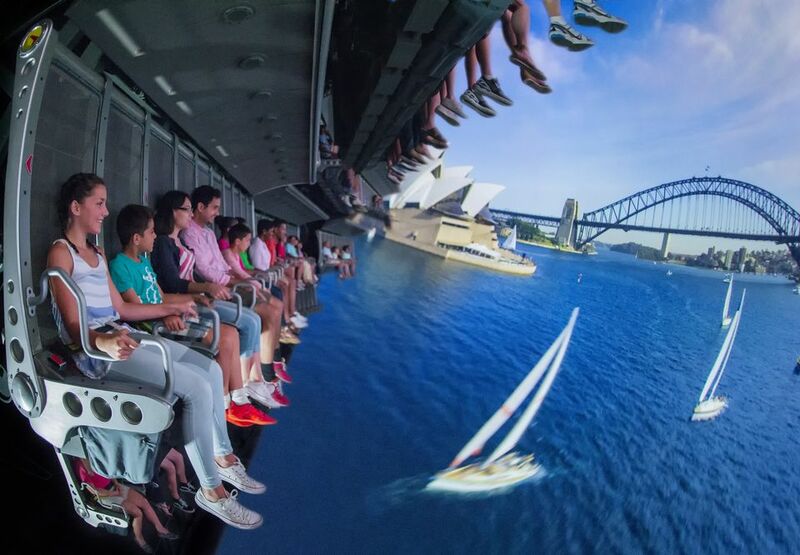 Soarin's motion bases, however, offer greater freedom of movement than speed room vehicles and are more adept at tricking passengers into believing they are immersed in the screened imagery. The IMAX film is projected at a higher frame rate than a conventional movie, which renders it lifelike and helps reinforce the illusion. The concept that Disney introduced has been adopted by other ride manufacturers and parks. In the industry, the copycat rides are known generically as "flying theaters." Disney's Soarin', however, remains the best of the bunch.